Much less is known about the first than the second King Harold of England, as it was the latter who lost his throne and his life at the Battle of Hastings in 1066 and was thus the last of the Anglo-Saxon kings. The first King Harold is usually known as Harold Harefoot. King Harold I, although King of England for a brief period in the 11th century, was not an Anglo-Saxon but a Dane, being a member of the short Danish interregnum before the Anglo-Saxons, in the person of Edward the Confessor, were restored to the throne. Cnut (Canute) of Denmark had ruled an impressive empire, comprising England, Scotland, Denmark and Norway, but when he died in 1035 this all fell apart. One major problem was that there was no obvious successor, as he left behind several offspring who laid claim to various parts of the empire. It did not help matters that Cnut would appear to have been a bigamist, having married Elfgifu of Northampton in 1016 and Emma of Normandy, the widow of King Ethelred (the Unready), in 1017. However, all sorts of claims and counter-claims were made in the records of the time as to which marriage came first, whether one or other “wife” was actually a concubine, and therefore whether or not the children of the marriages were legitimate. One fact that seems uncontested is that Elfgifu had two sons, namely Harold and Swein. It is recorded that Emma agreed to marry Cnut on condition that neither of Elfgifu’s sons would succeed to the empire should she, Emma, produce a son. However, it would also appear that Cnut’s later intention was that Harold should become King of England while Emma’s son Harthacnut ruled Denmark. In 1030 Cnut sent Elfgifu and Swein to Norway to look after that part of the empire for him. When Cnut died in 1035, Harold would have been about 18 or 19 years old. He apparently acquired the nickname “Harefoot” because of his athletic build and swiftness as a runner; however, this is not recorded in any document written earlier than the 12th century, so it may well be a later invention, or a result of confusion with another person. Harold had the support of the powerful lords of the Midland counties, probably because his mother was from that area. Harthacnut was in Denmark at the time, defending his lands, but his interests in England were protected by his mother Emma who was based in the Wessex capital of Winchester. One possible outcome was that England would be split between the half-brothers, with Harold ruling the north and Harthacnut the south. Swein was soon removed from the reckoning because he died late in 1035. However, Emma also had two sons by her first husband, Ethelred, namely Alfred (Etheling) and Edward (who would later be known as Edward the Confessor). They were living in exile in Normandy as guests of Duke Robert (father of William the Conqueror). 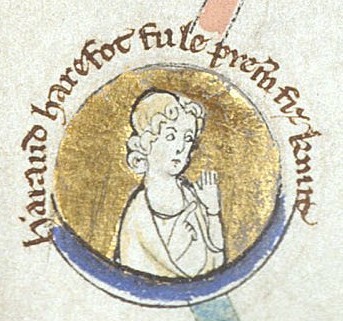 On Cnut’s death, Alfred launched an invasion of England but was intercepted by Earl Godwine (father of Harold II) and handed over to Harold Harefoot. Harold had him blinded and he died soon afterwards, possibly as a result of the blinding. Harold was then accepted as king by the lords throughout the country, even by Godwine who had earlier given his support to Harthacnut. Queen Emma was sent into exile in Flanders. Harthacnut realised that he had no chance of wresting the throne from Harold, as he did not wish to share Alfred’s fate, so he stayed put in Denmark. There is scarcely any evidence of Harold’s activities as undisputed monarch, but his reign was not a long one. He died in Oxford on 17th March 1040 and was the first king to be buried in Westminster Abbey. Harthacnut then arrived to claim the throne and promptly had Harold’s corpse dug up and thrown into a marsh. It was later retrieved and given a proper burial in a Danish cemetery in London. One report mentions that Harold was married and had a son, but, if he did, the son never entered the historical record as a claimant to the throne of England.